Prime Minister Benjamin Netanyahu issued a special statement for the occasion, saying, “On this Independence Day we mark two of the Jewish nation’s miracles: The miracle of revival and the miracle of building. The miracle of revival, because I an not familiar with any other nation in history that was scattered all over the world and lost control of its destiny but still managed to return to its homeland and rebuild its sovereignty there. “The other miracle is building: What we have built in this land since the State of Israel’s inception. Israel is quickly becoming a regional economic superpower and a global technological superpower. In this world of knowledge in the 21st century our possibilities are endless: In science, medicine, technology and art. In each and every field, the forces of genius within our nation break out and create a magnificent country,” the PM’s statement read. Netanyahu also mentioned the nation’s capital, saying, “We are not here by chance. We are here because this is our land. We’ve returned to our land, to our city – Jerusalem – because this is our land, this is our city. Knesset Speaker Reuven Rivlin lit the first beacon at the ceremony, and emphasized Israel’s commitment to the unity of Jerusalem in his address. “We will not apologize for building up Jerusalem our capital,” Rivlin said during his Independence Day speech, which focused heavily on Jerusalem and on the divisions within the city and its population. “In an era of cultural openness, we are witnessing a dangerous process of deepening entrenchment of each group behind its four walls. This entrenchment only creates cultural and political polarization. “Look at what Jerusalem has become in the past decade: separate neighborhoods, separate public transportation, separate shopping malls for Haredim and seculars, Arabs and Jews,” he said, referring to this separation as ghettos within the city. “Our fear of the ‘other’ across the wall, especially in Jerusalem, whether Arab or ultra-Orthodox, goes against the Zionist spirit,” said Rivlin. Rivlin also spoke of Herzl’s legacy during his Independence Day address, calling Zionism an act of courage. Rivlin concluded by saying that Israel will retian its Zionist character and make no apologies for it. “Make no mistake, there will be no cooperation with those who demand that we diminish the country’s Zionist identity. We will not apologize: not for conquering Katamon, Jaffa or Safed, not for freeing Hebron, and not for building Jerusalem our capital,” Rivlin said. 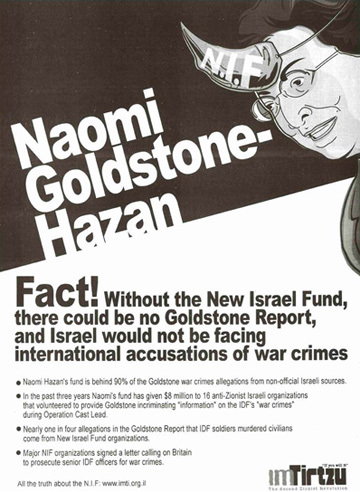 I recently learned of an advertisement created by the centrist Zionist organization, Im Tirtzu, that was highly critical of the New Israel Fund (NIF), political scientist and NIF President Naomi Chazan and the Goldstone Report. Im Tirtzu also published an analysis of the Goldstone Report that revealed much of the evidence mobilized by Goldstone was gleaned from sources supported by the NIF. In the wake of the ad and report, Chazan has been dismissed from her position at the Jerusalem Post. As exposed by Professor Gerald Steinberg of NGO Monitor, Goldstone was also a member of the Board of Directors of a third group, Human Rights Watch as late as July 2008. The organization accused Israel of war crimes well before the Goldstone Commission was appointed. HRW also receives hundreds of thousands of dollars annually from the Ford Foundation. The Jewish and Israeli Left have responded to the ad and report by claiming Im Tirtzu is engaging in McCarthyist tactics and encouraging the development of fascism in Israel. What led them to respond in such an extreme manner? When I took a look at the ad (see below) I could understand why they were upset. The imagery is indeed controversial. 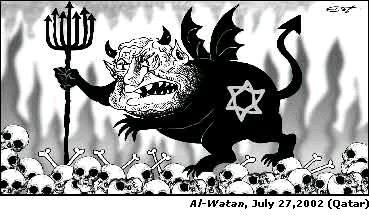 But is it really akin to that produced by fascist periodicals like Der Stürmer or the anti-Semitic illustrations common in newspapers and magazines across the Islamic world today? As you can see, Chazan is wearing a horn with the letters NIF attached to her head by a piece of string. Offensive? Perhaps. But it is obvious the horn is not part of her body. It is more like a mask. 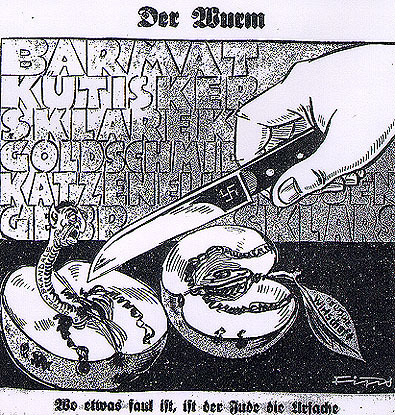 Contrast this to the classic and contemporary anti-Semitic imagery below. In these images, the figure is demonic and disfigured. In the bottom two, horns are not a mask but instead are part of the figure’s body. While some may think this is a minor differentiation, I disagree. It is incredibly important. Among the NGOs listed in the report are Adalah, Breaking the Silence, B’Tselem, the Association for Civil Rights in Israel, the Center for the Defense of the Individual, the Public Committee Against Torture in Israel, Yesh Din, Doctors for Human Rights, Gisha, Bimkom, Rabbis for Human Rights, Itach, Other Voice, New Profile, Machsom Watch and Who Profits from the Occupation. The report states that the above NGOs contributed “hundreds” of testimonies and other materials to the Goldstone Report, and that while Palestinian and UN sources inside Gaza were also consulted during Judge Richard Goldstone’s investigation in the Gaza Strip last summer, the bulk of the damage was done using the material provided by the Israeli NGOs. [A] Haaretz probe found that the influencial forces behind the movement make no secret of their rightist political loyalties. Financially, Im Tirtzu is supported by a foundation that has contributed to radical right-wing organizations such as the Women in Green; Pastor John Hagee, the head of Christians United for Israel (CUFI) which contributed to Im Tirtzu, has been implicated in the past by a number of anti-Semitic statements. Ideologically, the movement’s chairman Ronen Shoval used to be spokesman of the “Orange Cell,” a student chapter at the Hebrew University of Jerusalem that fought against the disengagement from the Gaza Strip and supported the settlement project. Shoval was even honored for his efforts with a citation from the evicted settlement block of Gush Katif. The main channel for donations to Im Tirtzu is the Central Fund of Israel. In addition to Women in Green and Im Tirtzu, it supports Honenu, an organization sponsoring legal defense to radical right-wing activists in trouble with the law. Honenu boasts of financially supporting the families of the Bat Ayin underground, convicted for trying to bomb a girls’ school in East Jerusalem in 2002; of Ami Popper, who shot four Palestinian laborers during the first intifada; Yishai Schlissel, an ultra-Orthodox man who stabbed participants in a Gay Pride parade in Jerusalem in 2005; and Haggai Amir, brother of Yitzhak Rabin’s assassin Yigal Amir. Im Tirtzu’s Web site asks donations to be sent through the American foundation. As to anything actually published by the organization, the forces of the Left have yet to bring forward anything. If you have some evidence linking this group to fascism–actual fascism, not simply promoting policies you happen to disagree with–please produce it. It is a horrendous accusation to make without any proof. Free to send to your family and friends courtesy of the Judah L. Magnes Museum in Berkeley, CA. Man, I love it when “progressives,” neo-Nazis, and other assorted “anti-Zionists” go crazy. And nothing is more certain to rile up and unite the Stephen Lendmans, Richard Silversteins, and National Alliance cretins of the world–and I should not leave out those wacky 9-11 Truthers–than when the Jewish people stand up for their identity and homeland. This is the case with a new organization called Z Street. I blogged about J Street a few days ago and just learned this morning about Z Street which has emerged to take the ideological struggle to college campuses and communities across the U.S. They are planning a major rally in Washington, DC, to coincide with the J Street’s first annual meeting (October 27, 2009). A new Zionist organization declaring support for Jewish communities in all parts of the Land of Israel and opposition to negotiations with terrorists was formally launched last week. The group, going by the name Z Street, intends to “serve as an educational force” and “a proud banner” behind which Zionists can rally, according to its founding documents. The group’s founders believe the current period is a “time of great danger to the Jewish State of Israel and, increasingly, to world Jewry,” warranting the establishment of a new, unabashedly Zionist advocacy group. “We need to show everyone that it isn’t only those on the left who know how to organize,” said Lori Lowenthal Marcus, a long-time Zionist activist and, with Allyson Rowen Taylor, a Z Street founder. Her point of reference, and the inspiration for the name Z Street, was the well-known Jewish-American far-left advocacy group J Street and its associated Capitol Hill political action committee. J Street calls itself “the political arm of the pro-Israel, pro-peace movement,” while promoting demands for Israeli territorial concessions and multilateralism. One question I have is how will Z Street differentiate itself from the Zionist Organization of America (ZOA) and other right-leaning Zionist organizations as well as non-partisan groups like AIPAC? Is Z Street seeking to reach out to younger folks than these two organizations or is its primary goal as a counter-lobby to J Street? If it is the former, I wish them much success. If it is the latter, I think AIPAC has done a good job for Israel thus far and that time, energy and resources would be better spent on AIPAC than creating a new organization. Two Interfaith Events: Europe and U.S.A.
(IsraelNN.com) A European rabbinical umbrella organization boycotted an interfaith conference on Monday after it was determined that Muslim delegates included members of the Muslim Brotherhood movement. The meeting, co-hosted by the European Commission and the European Parliament, took place in Brussels, Belgium. 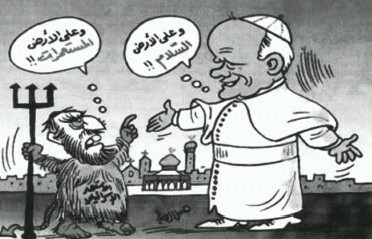 It was intended to bring together four religious leaders from each participating faith community. Three of the Islamic delegates were members of the Federation of Islamic Organizations in Europe (FIOE). Join former U.S. archivist Allen Weinstein and noted cultural scholar and writer Al Khemir for a wide-ranging, provocative discussion on how we can comprehend Middle East culture and history in a larger framework than the current eruptions of violence—exploring how we might develop greater appreciation of the commonalities between the people of the region. Most recently the Founding Director of the Museum of Islamic Art, Doha, Qatar, Dr. Al Khemir is an artist, television and film producer and author of a wide range of works including her recent novel The Blue Manuscript. She is also the author of ‘Waiting in the Future for the Past to Come‘ (1993) and the ground breaking essay ‘The Absent Mirror‘ (2005). The Honorable Allen Weinstein is a Visiting Professor at The University of Maryland, College Park. As the Ninth Archivist of the United States he is widely credited with having made the story of American Democracy more accessible. He is a former Professor of History at Boston University, Georgetown University and Smith College and the recipient of many awards including The United Nations Peace Medal. People…often credit the UN vote of November 29, 1947 as instrumental in creating Israel. However, while many Jews in Palestine danced in the streets the night of November 29, Eldad walked around depressed. Why? Eldad compares that night to the time when Israel danced around the Golden Calf and said, “This is the god who took you out of Egypt.” Here they were looking to the United Nations and saying, “This is the god who has given us the state,” and it wasn’t. The people who created Israel were the people who sat in prison and the people who were shot or hanged by the British. The facts on the ground are that the British would have left even if the United Nations had not voted for a Jewish state. Eldad also felt depressed that night because they were not celebrating the Jewish state that had been dreamt of for thousands of years and that he and others had been fighting for, but rather a truncated, shrunken Jewish state that would not have survived were it not for a miraculous war that followed. You can read more of Golan’s translations of Eldad’s writings here.